Chase: "Music, a little bit of skate. It's vintage (the t-shirt), I don't know anything about football or the team." I like how they both combined unexpected elements for an amped-up day look. Her asymmetrical haircut, sequin blouse, and booties are tempered by her denim jeans and cheery yellow handbag. His sport's team shirt is dressed up by the slight shimmer in his cardigan mixed-up with the unexpectedly preppy deck shoes. 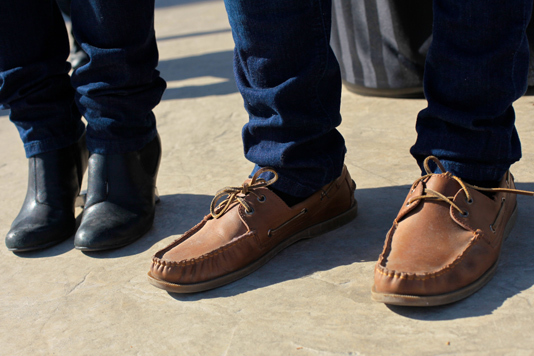 A closer look at her black booties and his deck shoes. Yesterday's and today's theme is pairs.